"when he owned the tract. He donated a burying ground from it to the Masonic fraternity, and when the good old man's friends cast about for a place to lay his bones, the Masons came forward with a lot from the ground he had given them, and his body now lies in the northeast corner of the Masonic cemetery." 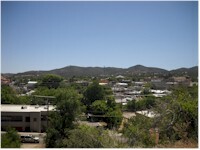 A grand panoramic view of downtown Prescott can be seen from the hilltop plateau on Carondolet Road where the cemetery is located.There are numerous Arizona pioneers, Union and Confederate veterans interred here as well as our brethren recently called to the side of the Great Architect of the Universe. cemetery is by appointment only (except for certain holidays). For plot and access inquiries contact the Secretary.